This question seems simple and often receives a straightforward historical answer. 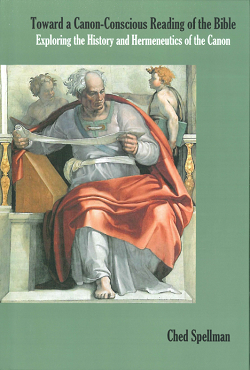 In this volume, Tomas Bokedal seeks to demonstrate that the question of canon requires the tools of the theologian as well as the craft of the historian. Bokedal begins by arguing that to understand the “complex phenomenon of biblical canonicity” (p. xiii), at least four broad areas must be taken into account: the effective-historical, textual-material, performative, and ideational aspects of canon. According to Bokedal, all four of these dimensions are “equally necessary to grasp the dynamic, multidimensional character of the Christian canon” (p. 20). Bokedal first delineates the effective-historical (and linguistic) dimension of canon. For Bokedal, the formation of the biblical canon is “at one and the same time” both a “contingent act” and also a “carefully designed literary work of art” (p. 6). The canonical Scriptures can be understood as “a carefully designed, yet spontaneous, literary creation in and for the church, providing textual and theological basis for ecclesial existence” (p. 7). Affirming both the intentional and contingent aspects of the canonical process in his understanding of canon allows Bokedal to draw together historical, hermeneutical, and theological connotations. While historical investigation often dominates the canon discussion, Bokedal maintains that theology is needed in order to capture the wide-ranging function of the canon within the life of the churches. The concept of canon, then, “refers to the Christian Scriptures as a theologically normative intratextual matrix, involving first of all the contents, but, also the textual arrangement, scope and ecclesial function of the scriptural canon” (p. 11). Bokedal then discusses the textual-material dimension. Several textual features of the canonical collection directly affected the way it was utilized within the believing community. The presence of nomina sacra in the earliest manuscripts of the New Testament points to an almost immediate reverence for Jesus and his teachings (chapter 3). The early preference for the codex format shows a specific concern for the way these particular texts were gathered and collected together (chapter 4). The clear connection between oral and written proclamation of the gospel and the teachings of the apostles highlights that early on these two textual streams function as a “two-fold norm” and cannot be neatly separated (chapter 5). Further, Bokedal draws out the implications of the textuality of the biblical texts (chapter 6). Understanding a “text” to be a “woven texture that holds together” (p. 201), Bokedal notes that the nature of texts is that they express a unified whole (something the nomina sacra, the codex format, and the titles of the canonical collections also imply). Bokedal next examines the “ritual” dimension that provides a framework of meaning for those using and encountering the canon within the Christian community (chapter 7). From their inception, the emerging New Testament writings were read and re-read in liturgical contexts. Alongside of but in distinction from the Jewish Scriptures, the four Gospels and the Pauline letters mutually informed one another as they were read in textual and physical proximity. Finally, Bokedal outlines the ideational dimension of canon by demonstrating the ongoing importance of the rule of faith alongside the developing collection biblical texts (chapter 8). For Bokedal, the rule provides the story, scope, and scopus (its gravitational center) of the canonical collection. The “logic of the Christian canon” (pp. 309-10), then, involves the authority of this collection of biblical texts to have a “free power” over its readers. Bokedal also engages the related debate about criteria for canonicity and shows that “apostolicity” is the fountainhead from which the other criteria flow (chapter 9). Bokedal concludes his volume with a helpful conclusion that summarizes the main steps of his argument. Because Bokedal’s study draws together wide-ranging discussions and offers several intriguing proposals, it will inevitably raise questions and prompt readers to re-evaluate a number of issues. A central strength of Bokedal’s study is the way it demonstrates that these lines of inquiry actually and organically intersect in a study of the biblical canon. For Bokedal, the function of Scripture as canon involves in some ways all of these elements. Synthesizing a multiplicity of approaches can easily become unwieldy. The value of Bokedal’s work here is that he architects a blueprint for how some of these scholarly sub-structures fit together to form a durable foundation for constructive analysis of the canonical text. For example, Bokedal explains that the special abbreviation system related to a select group of “sacred names” (nomina sacra) is consistently found in the earliest manuscripts of the New Testament. This feature appears to stem from the reverence given to the divine name in manuscripts of the Jewish Scriptures. This shared feature has implications for canon formation, as early manuscripts with this particular characteristic can be related and grouped. Bokedal takes this observation about this textual-physical feature of the manuscripts and directly relates it to the theological commitments of the earliest churches. The nomina sacra are not random, but rather are remarkably consistent and grouped around the theologically freighted words GOD, CHRIST, JESUS, and LORD. “Editorially,” Bokedal argues, “the presence of nomina sacra indicates a unity of the Scriptures and a particular Christian narrative and theological focus” (p. 121). These particular terms also capture the heart of the rule of faith, a theological formulation that ensured a correct understanding of the Bible’s big picture in the earliest churches. These theological keywords represent “a condensed telling of the total narrative through which canonical Scripture identifies God and the personal name for the God so specified. The name embracing the narrative, the salvation-historical narrative centering on the Name” (p. 308). In this way, Bokedal directly connects the emerging New Testament collection with the embedded textual feature of nomina sacra, and then shows how this textual practice and the rule of faith mutually inform one another. As Bokedal asserts, the rule of faith serves the “crucial function of establishing a Mitte der Schrift and a textual biblical whole, as well as providing a fundamental framework for the canon formation process” (p. 120). Strategically, then, Bokedal offers actual literary, manuscript, and historical evidence for some of the salient theological conclusions that must be made about the Christian canon. Bokedal makes similar types of arguments about the unusual Christian preference for the codex format and the relationship between oral and written proclamation in the earliest churches. 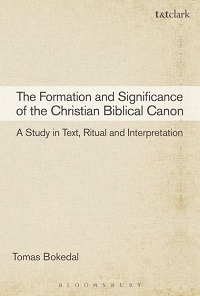 This tangible textual and paratextual evidence for this theological and hermeneutical perspective on the emerging biblical collection compellingly establishes that the concept of canon was active in the earliest churches long before the fourth and fifth century lists of authoritative books began to appear. One perennial critique of a high view of Scripture is that the distance between the first and the twenty-first centuries can only be tenuously bridged by historical reconstruction (or is even unbridgeable). In response to this type of historical-critical mindset, Bokedal marshals several streams of scholarship that help him articulate the present function of an ancient canonical collection for contemporary readers. For example, from Hans-Georg Gadamer, Bokedal engages a “hermeneutic of tradition” that exposes the way that an “understanding” of historical writings unavoidably actualizes the meaning of the past for a present reader (e.g., see pp. 21-30, p. 46ff). Related to the process of passing on authoritative traditions within a community, Bokedal draws on Brevard Childs’ insight that there is an organic connection between the process and product of canon formation (see pp. 16-19, 42-54). Pushing this idea further, Bokedal also draws on semiotic studies to highlight the reality that the final form of the canon and in particular the “concept of canon” (see pp. 19-21, 31-35), serves a social function within a community that views it as an authoritative guide for faith and practice. A semiotic definition recognizes that the “canon” relates not only to physical dimension of the collection itself but also to the “early ecclesiastical use and interpretation in which the biblical text and reading emerged” (p. 19). Against the prospect of an “ugly ditch” that needs to be bridged by historical reconstruction, Bokedal argues that the concept of canon and the reality of the canonical collection is in fact what bridges this divide. By means of its textuality and canonical function, then, the ancient Christian canon is able to bear meaning and speak a word in the present tense and to contemporary readers. In other words, the unique textual dimensions that constitute the Christian Scriptures as canon are also what continually establish them as such. In this way, Bokedal is able to articulate a model of canon studies that includes the process, the product, and the continuing function of the Christian canon within the believing community. To be sure, Bokedal’s thought-provoking study deserves careful consideration. Here is a deep interdisciplinary reservoir from which both historians and theologians can profitably draw as they grapple with the reality of the Christian canon. Also in JETS 59.3 (2016): 601-03.